Once firefighters have arrived and positioned their apparatus, they must go to work. Some factors affecting their efficiency include: the distance and terrain between the apparatus access and the building; how easily they can enter the building; the building’s interior layout and vertical access (stairs/elevators/roof access); and, how quickly firefighters can locate fire protection features and utilities. The designer can make a positive impact in all of these areas. Firefighters must hand carry all equipment beyond the point where apparatus access ends. Increased distance translates into additional time and effort to set up ladders, hose lines, and other equipment. If the area is easy to negotiate by foot, firefighters can move more quickly. The IFC and NFPA 1 contain requirements for access to building openings, such as approved walkways that lead from the apparatus access points to the entry doors. Fire department pumpers carry hose lines for attacking fires. These are usually smaller in diameter than the hose lines used to supply water to the pumper from a water source. Many pumpers have one or more hose loads of a fixed length connected into a pump discharge. These are “pre-connected” hose lines, often called simply “preconnects.” Firefighters deploy them rapidly for quick fire attack. However, their useful range is limited by their length, which is generally between 100 and 400 feet. Designers planning unusual designs for their buildings or working with unusual sites should coordinate with the local fire department regarding hose line access unless a standpipe system is provided in the building. Buildings under construction or renovation pose their own particular concerns to the fire service. Code provisions can be found in the IFC Chapter 14, IBC Chapter 33, NFPA 5000 Chapter 14, and NFPA 241. Designers should consider the accessibility of fire department connections, fire hydrants, and entry points. Some locations may be more likely to be obstructed by construction storage, truck unloading, cranes, phasing of the construction, and security fences. Designers should consider specifying these locations and the location of temporary and permanent fire protection equipment to avoid conflicts (Figures 5.14 and 5.15). If firefighters need to conduct interior fire suppression operations, they must enter the building at one or more points. The fire service has an array of tools to force entry into buildings. However, forcing entry takes extra time and usually damages the building. Key boxes (also called “access boxes” or “lock boxes”) are small lockable vaults mounted outside building entrances (Figure 2.18). They are opened with a master key held by the fire department. Inside the box are the building’s keys. Some jurisdictions require key boxes; others give building owners the option of installing them, or risking the need for firefighters to force entry into their buildings along with any resulting damage. Code officials enforcing the IFC and NFPA 1 may require key boxes. When key boxes are optional, designers may want to educate owners on their benefits. (Fig. 2.18) Key box adjacent to fire command center. Theses boxes are often provided at main building entry doors. Note the fire department connection on the left. First arriving firefighters will often base their point of entry on which windows have fire or smoke venting from them. In most cases, entrances that serve any particular window will be readily apparent from the outside. If it is not obvious which door to enter to reach which area, signs or diagrams should be provided outside each entrance door indicating portions of the building accessible from the corresponding door (Figure 2.19). (Fig. 2.19) Apartment locator. This door does not access apartments whose windows flack it. In multi-tenant buildings, such as shopping centers and malls, tenants usually have rear exit doors that firefighters may access. Often these doors look alike, making it hard to correlate a given door with a particular tenant. Labeling rear doors on the outside with the tenant’s name, address number and/or suite number, using lettering at least six inches high with a 1/2 inch stroke (thickness of lines in each letter) prevents this problem (Figure 2.20). (Fig. 2.20) Rear doors of a shopping center labeled for rapid access: utility room, fire protection equipment room, and individual tenant space. Any door that appears to be functional from the outside, but is unusable for any reason, should have a sign reading “THIS DOOR BLOCKED. ” The lettering should be at least six inches high with a 1/2 inch stroke. If these doors are properly marked, firefighters will not waste time trying to gain entry through them. Large, unusual, or complex buildings present a challenge to maneuvering and locating specific areas. Directional signs with room/tenant numbers, and graphic directories of tenant/agency layout can assist the public (Figure 2.21). The same diagrams may assist firefighters if they include: stairway and elevator identifiers, fire hose valve locations, fire alarm control panel location, fire alarm annunciator location, fire pump location and other fire protection features. Diagrams should also contain features to assist unfamiliar users with orientation, such as road names or a compass point. Detailed floor plans showing building layout and fire protection systems can assist the fire service. In buildings with fire command centers, a good location for these plans is in this command center. In other buildings, these plans may be locked inside the fire alarm annunciator panel. Fig. 2.21) Shopping complex diagram with views of the overall complex as well as the interior tenant diagram of the building in which the diagram is located. 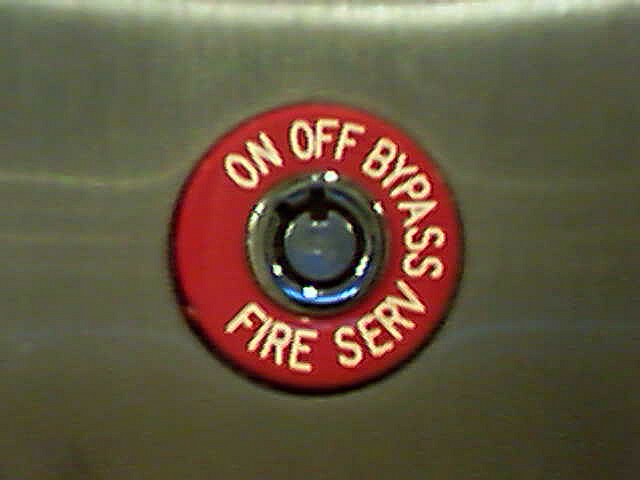 A routine function in any advanced fire suppression operation is to control (usually shut down) utilities. Making it easy to locate and identify utilities will speed firefighters’ progress. Electric, gas, and other fuel controls should be located either in dedicated rooms with exterior marked entrances, or at exterior locations away from openings such as windows or doors (Figure 2.20). NFPA 170, Standard for Symbols for Use by the Fire Service, contains symbols for marking gas and electric shut-offs. Air handling equipment should also be prominently marked, especially if located out of sight. The fire service may need to quickly access rooms containing the following equipment: water service, control valves, fire pumps, electric service, switchgear, generators, fans and other mechanical equipment. Lettering for this signage should be at least six inches high with a 1/2 inch stroke (thickness of lines in each letter), unless the standard symbols are used. Marking of fire protection system devices within buildings is discussed further in the chapters on fire alarm systems, sprinkler systems, standpipe systems, and fire department connections. 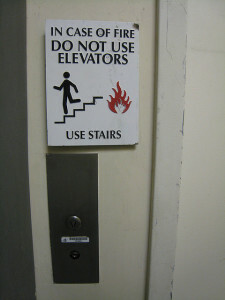 The use of elevators during fire incidents is very controversial. Elevators are not usually used for occupant evacuation. One exception is trained operators evacuating occupants with special needs. They should, however, be designed for fire service use. 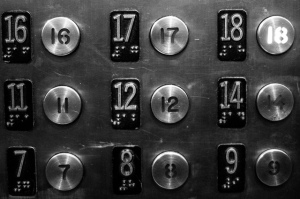 The elevator standard widely referenced in building and fire codes is ANSI A17.1, Safety Code for Elevators and Escalators. It details the two phases of emergency operation. Phase 1 of elevator emergency operation consists of a recall system that automatically sends elevators to a “designated” primary level. This occurs upon activation of a manual recall switch at the designated level or upon activation of smoke detectors in the elevator lobbies, hoistways, or machine rooms. If a detector is activated on the designated primary level, the elevator cars go to an alternate floor level. In either case, the elevators are rendered unavailable to building occupants. They remain at the recall level with doors open, so the fire service can quickly determine that they are clear of occupants and then use them in a manual control mode. Did you know? 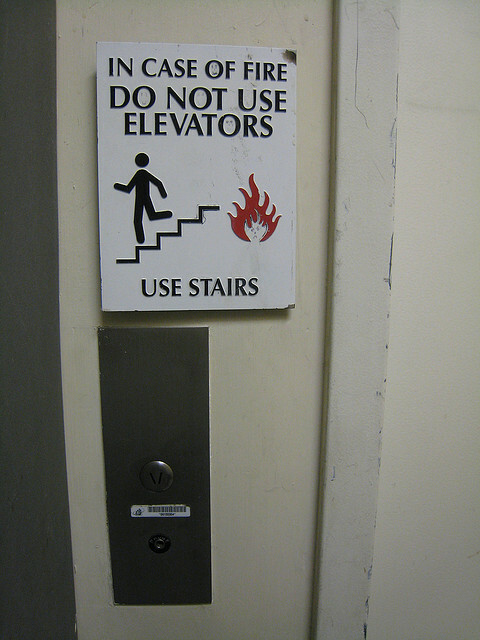 Elevators can not be used during a fire by building occupants. The designated recall level usually is the ground or entry level. This will facilitate rapid fire department access. For buildings with entrances on multiple levels, designers should consult the fire department about the entrance firefighters intend to use initially. The fire department may also prefer to coordinate the designated recall level with the location of the fire alarm annunciator, fire control room, and/or the fire department connection. Phase 2 emergency operation permits the fire service to use the elevators under their manual control. Phase 2 operation overrides all automatic controls, including the Phase 1 recall. Solid-state elevator control equipment operates correctly only if maintained within a certain temperature range. NFPA 101, NFPA 5000, and the IBC require independent ventilation in machine rooms containing solid-state equipment that controls elevators traveling over certain distances. Whenever such elevators receive emergency power, their corresponding machine room ventilation would also receive emergency power. 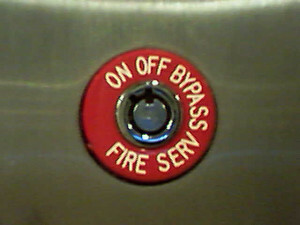 These features help maintain at least one elevator operational throughout fire suppression operations. Currently, ANSI A17.1 requires an automatic power shutdown feature for elevators that have fire sprinklers located in their machine rooms and, under certain conditions, in hoistways. Shutdown occurs upon or prior to the discharge of water, usually when heat detectors mounted next to each sprinkler head are activated. These heat detectors have both a lower temperature rating and a higher sensitivity (a lower response time index) than the sprinkler. However, to minimize the chance that firefighters will be trapped by a power shutdown, the temperature rating of the heat detector should be as high as feasible. Another shutdown method involves water flow detectors; however, these detectors cannot employ a time delay, so designers seldom choose this method. Note that in many cases NFPA 13, Standard for the Installation of Sprinkler Systems, permits sprinklers to be omitted from these areas. The National Fire Alarm Code, NFPA 72, requires that smoke detectors in either the elevator hoistway or the elevator machine rooms trigger separate and distinct visible annunciation at both the fire alarm control unit and the fire alarm annunciator. This alarm notifies firefighters that the elevators are no longer safe to use, and it also provides some warning time prior to the shutdown feature that is required with sprinkler protection. 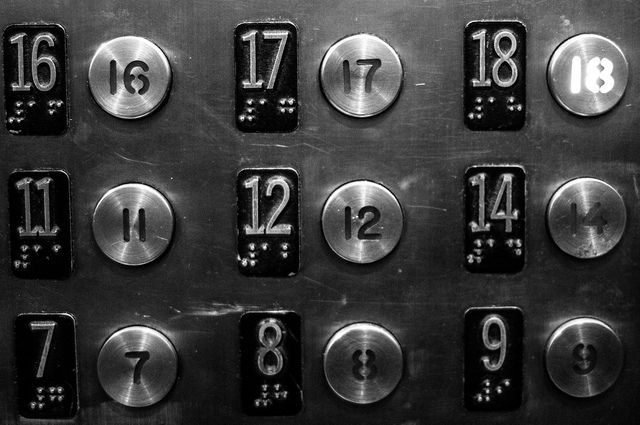 In addition, ANSI A17.1 requires a warning light in elevator cabs to flash when an elevator problem is imminent. NFPA 1, NFPA 101, NFPA 5000, the IBC, and the IFC all require that identification signage be provided inside stairwells at every level (Figure 2.22). These standards all require stairwell signs in buildings over a certain height, but the height thresholds vary. Signage should show the stair identifier, floor level, terminus of the top and bottom, roof accessibility, discharge level, and direction to exit discharge. On floors that require upward travel to reach the exit, a directional indicator should also be provided. It is important that these signs be located 5 feet above the floor and be visible with the stair door open or closed. In hotels or other buildings with room or suite numbers, the signs should also include the room or suite numbers most directly accessed by each stair on every level, (i.e., second floor of stairway 3 has direct access to rooms 202 through 256). The latter signage would be extremely important where certain stairways provide no access to some sections of the building. (Fig. 2.22) Stairway ID sign. Buildings more than 3 stories in height above grade should have roof access. The IBC and IFC require this, except for buildings with steeply-pitched roofs (with a more than 4:12 slope). As stated above, the IFC, the IBC, NFPA 5000, and NFPA 241 contain special construction/demolition requirements. One stairway should be completed as construction advances. Conversely, as demolition progresses, one stairway should be maintained. These standards also address lighting and fire rating of the enclosure. Building and fire codes typically require that stairs accommodate exiting occupants. Fire service personnel who may use the stairs are not factored into exit capacity calculations. In situations where occupants are still exiting and firefighters are using the same stairs to enter the building (“counter-flow”), the evacuation may take longer. Furthermore, in most cases, stairway capacity is designed based on the floor with the highest occupant load. Typically, stairs are not widened as one travels in the direction of egress unless the stairs converge from both above and below. This approach assumes that people will evacuate in a phased manner, beginning with the floor(s) closest to the fire origin. In an immediate general evacuation, or when people from other areas self-evacuate, the increased load will slow evacuation. Both of these bottlenecks will be made worse as the height of the building increases. Furthermore, total evacuation is becoming more commonplace due to concerns about terrorism. An effective solution to the counter-flow issue is a dedicated firefighting stairway. Codes in the United Kingdom contain specifications for such fire-fighting stairs, elevators, and intervening lobbies in buildings of a certain height (Figure 2.23). Current U.S. codes do not require dedicated stairways or elevators. The disadvantages of dedicated firefighting stairways include: cost, space, and the effort needed to keep them clear and in operating order. A solution to egress delays caused by either counter-flow or total evacuation is to provide additional exit capacity by means of additional stairs or widened stairs. Cost and space are also disadvantages of this solution. Fig. 2.23) Dedicated firefighting stairway/elevator tower. © Crown Copyright 2000 Queen’s Printer of Acts of Parliament. These issues currently remain unresolved in the code community; however, a designer may encounter these issues on projects for large, high-security, or high-profile facilities. Further guidance on the movement of people in buildings can be found in the Society of Fire Protection Engineers’ publication, Human Behavior in Fire. Consider firefighter foot access in site design. Avoid using areas that are likely to be obstructed (i.e., shipping and receiving areas). Label blocked doors with exterior signage. Coordinate temporary construction storage and loading areas with access points and fire protection features. Provide key boxes when required; recommend their use in other areas. Locate key boxes as recommended by the particular fire department. Include fire protection features on the building directories. Provide signs or diagrams at limited access entrances. Identify rooms containing utility shutoffs and fire protection equipment. Coordinate elevator recall level with fire service operating procedures. Design elevator shutdown feature to minimize the chance of trapping firefighters. Provide identification signs at each level of every stairway. Exten stairs up or down with construction or demolition; consider the need for lighting and rated enclosure. Where total evacuation of a large building is likely, consider additional egress capacity. Where firefighter counter-flow is expected, consider additional egress capacity or dedicated firefighter stairs.